Winter is finally here with a big cold bang, the temperatures have dropped suddenly and Christmas is only 29 days away! The poor old allotment isn’t Winter ready however, due to very hectic work commitments the brassica bed was non existence and therefore there’s no purple sprouting broccoli , kale, red cabbage, turnips, swede or sprouts to keep me going throughout the cold spell. 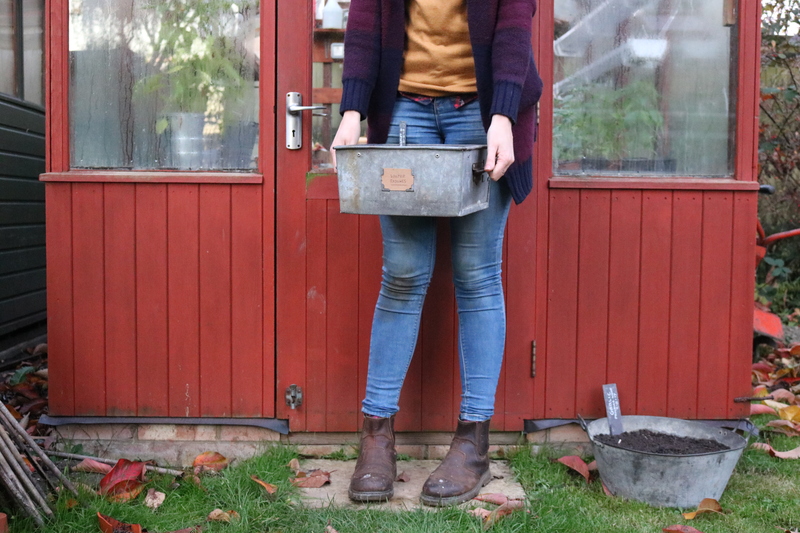 There are some over wintering leeks, swiss chard and a few carrots still waiting to be picked so it’s not all that bad… but I’m delving into another way of producing crops throughout the Winter and it’s a bit of an experiment for me. 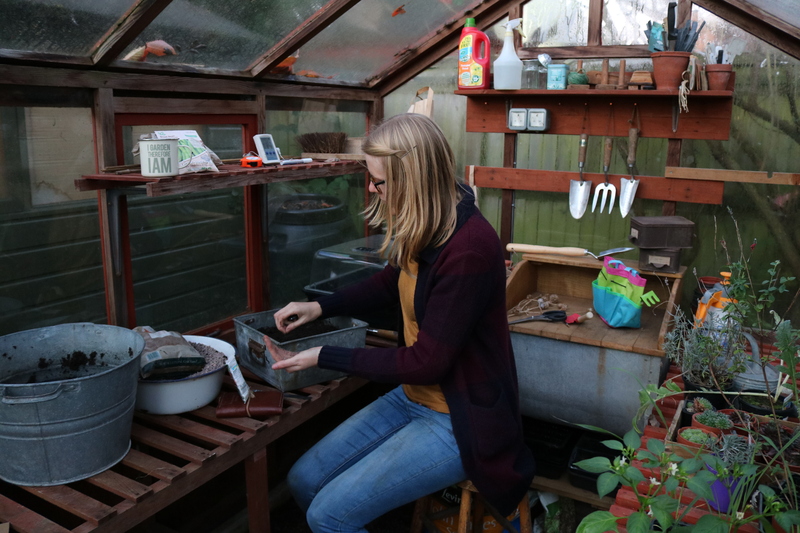 I absolutely adore radishes, they are a new found love and one that I can’t seem to live without so I’ve decided to have a go at windowsill growing to see if I can get a steady crop throughout the Winter months. I found an old galvanised container which is roughly 6 inches deep, I didn’t drill any drainage holes into the bottom because it will be sitting inside on the windowsill so instead I filled the container with 2cm of grit. Remember to keep in mind the variety of radish you will be growing, for instance I’m growing ‘Scarlet Globe’ which is a smaller, round variety. If you are growing longer varieties like ‘French Breakfast’ you might need a deeper container with that extra bit of room for the roots. Next I used some homemade compost to fill the rest of the container and then created a drill with my finger 1/2 inch deep where I sowed the first row of seeds. In two weeks time I’ll sow another row and then two weeks after that I’ll sow the last row, by that time the first row will be ready to harvest and I can replace them with more sowings. This will create a perfect succession of harvests and if all is well I’ll have radishes coming out my ears! Water the seeds in and then remember to keep the container moist, preferably watering it every other day so the soil doesn’t dry out. 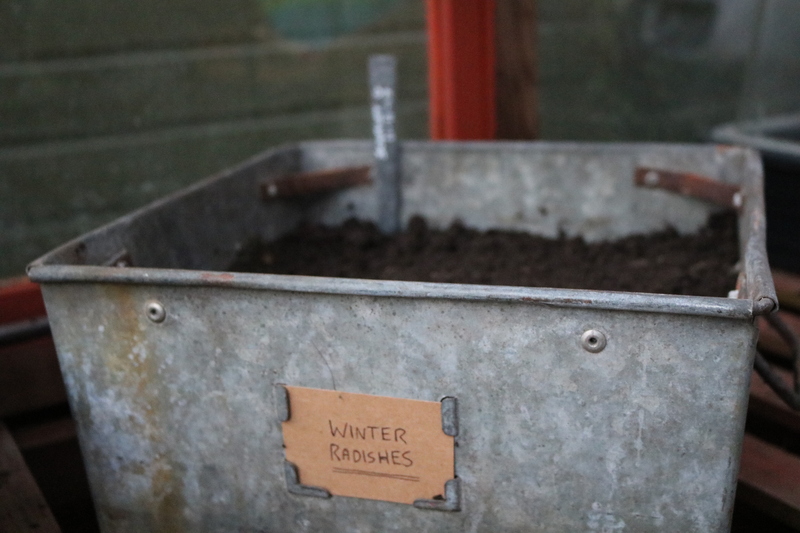 Place the container somewhere warm and in direct sunlight, a windowsill facing the sun will be a perfect place for the radishes to grow. Last but not least simply enjoy them all throughout the Winter! 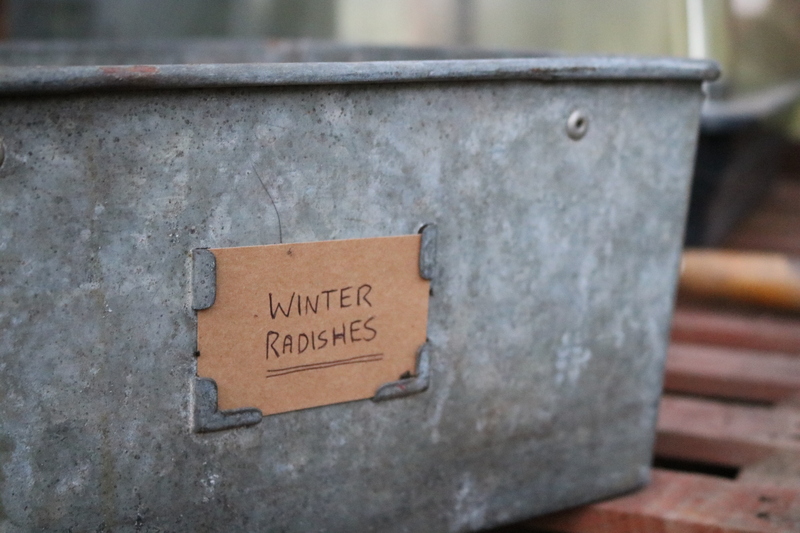 “Winter radishes… a perfect succession of harvests”. The March of the Radishes. Lovely idea.I have been eating winter Radish, a variety called Mooli they are huge like Autumn carrots but fairly mild.My friend grew them and kindly shared with me.I love them in stir fries and salads.I will be growing my own next year….outside of course. Thank you Helen and my what massive rasdishes! I’m hoping to grow a heritage variety next year, in fact the same variety that Peter Rabbit takes from Mr McGregors garden!